List of characters and, thanks to them all for their contribution the success of this tour. Now might be the right time to start the journal for the Potters Return 2008. Only two days ago in conversation with a friend, he asked ”do you keep a record of these projects?” and me saying, “generally yes but this tour has been so incident free it would be uninteresting reading”. In the back of my mind, a warning, there is still time for hiccups, and it came yesterday, more of a vomit than a hiccup. A phone call from Ravi stating he couldn’t get economy seats in the designated time, disbelief and frustration, bordering on anger, considering, they have had the dates and money since October, admittedly, Shyam was not certain of his plans but he had made a decision not to come before Christmas. ( When I was in India in October 2007 Shyam had warned due to family pressures he may not be able to come, this had come to pass however I have been feeling positive about this as it will allow myself and the potters a greater chance to relate.) I had made the assumption that all was in hand, again a dangerous assumption, when will I learn. However I am trusting as in the past, at 11.55 pm all will come through. The frustrating aspect being the waste of money, this will impact on the fee for Rishi. A concern is the Giri Raj and Manori will baulk at spending the extra money on fares. Another frustrating aspect is not knowing what is going to happen, maybe there is also a lesson in there for me. Later; text message, “can they fly 7th night reach 8th night like last time, fare is 70 thousand?” ( approx $2000) so much money but a weight has been lifted, I feel confident we can make money for Rishi somehow, thankfully I did not state an amount to him in our talks. I think I have now entered the phase of preoccupation, now until the 1st March when they leave. It’s now on. That last statement was a little premature and still is. Several days later in an email from Ravi ”still waitlisted hope to confirm today” However it I had been given respite from anxiety to get on and enjoy the weekend, so, back to now waiting to hear they have been issued with visas. Call from Ravi last night, “will they receive/ be paid while they are here?” best to go with the truth, not really knowing what is the ‘right’ response. They had received a call from the Embassy, a section not completed on the form. Still to hear from Shyam why the ticket debacle, Ravi states “no recriminations” who is he shading, is it me? I am looking forward to them being here. For three weeks my focus will be on them and the workshops not being drawn between my family, house building and my own work. Later: Enjoying the wait for a meeting at Artplay by the Yarra near Deborah Halpens Angel. I think this area is going to be good to spend 10 days, open air but activity and great Melbourne vistas. 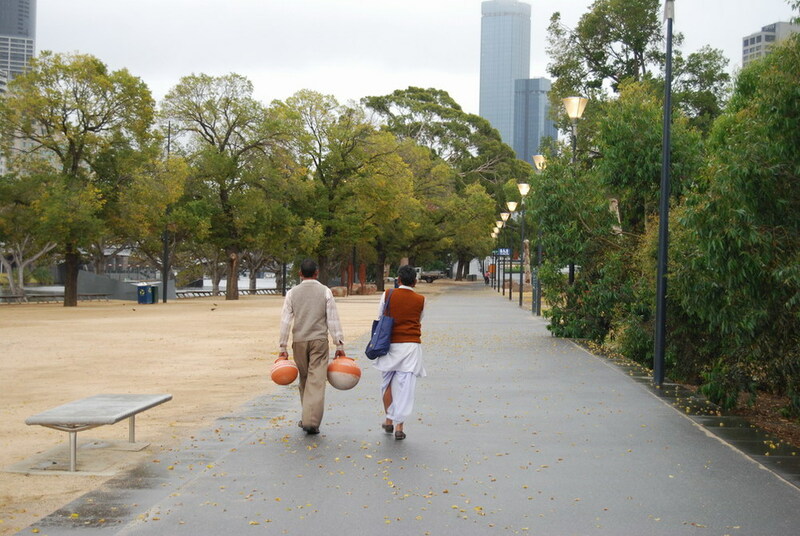 I will be happy to show Giri Raj and Manori this Melbourne. After the meetings at Artplay got the train to Easy Street with Ann, she was not feeling well. Mike and I discussed options for the production of the book and then did a final edit. (Ann, Mike and I had visited Hastal Village where Manori lives in October, Mike had made a short DVD with the view to also creating a small book. For the book he used my images from several trips and some edited text originally written in 2002) meanwhile Ann is getting worse. I left when they were about to take her to St Vincent’s. Since then on the tram several texts from Ravi discussing details “passports retuned today”. Meaning they have the visas. So they arrive on the 9th, with one day to get organised before the workshops, I think that will be enough, 5 days would be too much. Collected the potters last night, they were waiting for us outside the terminal they got through all formalities quickly. At this moment I need to record I am having second thoughts about all this, I trust it is first day reservations and tiredness. Last night the potters left and I am ‘left’ exhausted and my mind going to them as they are having their stopover in Bangkok, possibly apprehensive to leave their 4th floor daystay room and definitely apprehensive to shop. At this point I am too tied to reflect on the last 3 weeks, 3 weeks without a moment to get to this journal and I see on my desk a gift from 10 days ago, a book on Nolan with the plastic cover still on!! I look forward to settling with this journal soon and recounting the most positive time just spent. Not quite what I had in mind, settling with this journal, ’ sitting’ at the Northern Hospital with Will waiting for him to go to surgery to readjust a fractured thumb, Recollections of a trip last year to the Children’s Hospital for his hip pinning I am confident I have time on my hands. So I am ‘settling’, not the serene atmosphere I imagined but an opportunity. We have just spent the last 7 hours filling in time now it is time to write. At this point my overwhelming thought is , how remarkable to spend most every waking hour with, or aware of the whereabouts of GRP and ML for 3 weeks and, at the end of 3 weeks feel there is still time to share. However, I have not missed the 6.30 alarm clock of them rising. I have enjoyed these first two morning sleep- ins and no throat clearing routine. Saturday after their 12.45 am departure was beautifully relaxing with no one at home, washing, and a snooze in the afternoon basking in the warmth of the previous 3 weeks experience. The other realization was the dependence of the two on me, but, at the same times their self sufficiency, happy in their own space. I acknowledge I do now know how to create the space, food, work and environment in which they are comfortable. We have worked effectively as a team of equals, seemingly minimal ego present, each of us wanting to present the others in the best light, them doing their ‘best’ in workshops and myself facilitating those workshops for smooth running. And, not to find one aspect of personality in 3 weeks annoying, but many aspects comforting, e.g. getting into the car and hearing Hare Rama Hare Krishna ( were they asking for safe passage) ; hearing their melodious conversations, with GRP’s Hindi some understanding with ML no understanding, but the deep sounds and occasional laugh calming, and sometimes silence in the car, I picked up their calm. Why are they calm in the face of the unknown workshop situations and language barrier. ( I was aware that although GRP has more spoken English ML seemed to translate conversations and situations more readily) They were seemingly relaxed with workshop participation and moving into challenging social situations. For me the exhaustion and constant time pressure begins to fade so recounting the last 3 weeks a.s.a.p is important. This time 3 weeks ago I would have just discovered I had flattened the battery on the ute by leaving the warning lights on while parked at Artplay, what to do? To late to call the RACV. We continued to do what was necessary at Artplay. That morning, Monday 11th February we had travelled from Tallarook. The travelling pottery circus. Bags of wood on top of the car, 44 gallon drumkiln on board and assorted equipment including two traditional pottery wheels a crate of shards for a kiln roof and our bags, a small one each for the men and a big one for me. The clay was just being delivered to Artplay as we arrived. It was soon discovered that it was too hard for the workshop needs and so began a process that was to continue throughout the workshops, that was of, cutting up the clay into small pieces, wetting it down and then re-wedging it to a softer consistency. This is something we could have done without as it was time consuming and physical. ML then threw the beginnings of some waterpots, also a constant activity throughout the first 2 weeks. I called my sister Tanya to collect us as we were to leave the ute at Artplay for the night and deal with the flat battery the following day. We waited at Princes Bridge with our bags and a box of perishable food from Tallarook. GRP stuck up a conversation with an Indian woman who was waiting for her biker partner( I noticed on this tour there was often a Hindi speaking person not far away if we needed ‘help’) Tanya arrived and we piled into her car. ML hitting his head in the unexpected movement of the boot. We settled into our rooms at Tanya and Scott’s, luxurious for us all. And then prepared the evening meal, thus beginning the routine for the next two weeks. That being, the men made the roti bread and generally I prepared the subji vegetable curry. They wake at 6-6.30 and go outside for a bidi , smoke. I walk to the bakery for the breakfast and lunch bread. They shower shave and hand wash clothes while I make the chai and lightly cook and butter their bread, we have breakfast. I make a thermos of chai, they have a bidi outside, I have a shower and then we head into Artplay. The first morning by tram as the car was still at Artplay. Will we make it in time and have time to ‘relax’ before the first workshop? Rishi and Abhi arrive and we go over the programme for the morning. The first group was Abbotsford Primary School a Southkids school, it was great to have Nadia and Vicky there for those first workshops. As with all the groups, the children are spellbound by the demonstrations. ML usually going first with a mudka ( water pot) then GRP making one of his carefully completed forms and ML again with a flowerpot. During second component of the morning session the children had a go on the wheels making a small pot assisted by one of the potters. I think this was the highlight for the children. Throughout the 3 weeks the potters never tired of working with the kids. Each child was afforded patience and focus. I asked GRP once if he tired of this and he stated it was a privilege for him as it was like being in touch with god through the purity of the children. Both potters connected with the children and were aware of and catered for those with a sensibility for the job at hand by letting them have the time by themselves on the wheel. The potters bought calm to the experience that was reflected in the no drama way the children responded to their turn. So, the mornings went well, the drawing sessions in the afternoon were of mixed success. It did work better the second week. The first week we attempted to transfer the drawings to the children’s pots, it became too rushed and unfocused. The second week as the pots were not drying enough to work on we changed the programme. Watching the DVD, A Potter’s Village before going to lunch and then after lunch a prolonged drawing session after watching a series of Indian graphic images. This suited the Gilghai Steiner school, possibly because they have a culture of the value of drawing that was not as well established in the other schools. 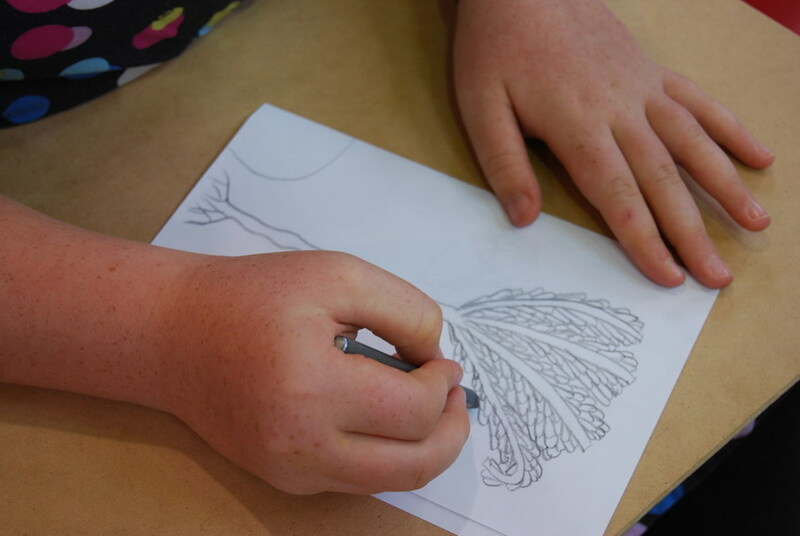 Some beautiful drawings were created without the stress of transferring the images to the pots as we were trying to do in the first week. The Question and Answer sessions at the end of the day was always an interesting time. The most often asked questions being. “At what age did you start making pots?” And, “How many pots can you make in a day?” When asked what would you do if you could choose. (A question arrived at from the introduction where I discussed the potters job being an hereditary one) M.L stated he had never considered another job and , G.R.P stated he could do anything but chooses to do pottery. This session also afforded an appropriate time to conclude the workshop. The appreciation expressed by the participants was always welcome. Each evening varied but we were never home early enough. The first Tuesday we had to wait for the RACV; Wednesday a trip to Easy Street to get GRP pots and stack a kiln of M.Ls forced dried waterpots; Thursday to Lene’s to pack her kiln with ML waterpots and then on the Manningham Art Centre for a two hour workshop. Rishi finally responded to my text messages to say he would not be coming. The Hindi speaking dance teacher from Manningham Art Centre was contacted and he was able to come. The workshop went well it is always good to do such things with your peers and I am sure the potters also appreciated the change from the children. I was starving and not looking forward to cooking when we got home so dropped into Victoria Street for a soup. ‘garam pani’ ( hot water) with noodles lots of laughs in our tried state. Friday was the beginning of the Sustainable Living Fair (SLF) at Federation Square. We were booked for school groups, the last group did not show so we had time to go to Ann’s for another kiln stacking then return with pots and change for her exhibition opening. She incorporated an opening ritual with the painted potters wheel, candles and rose petals, it was nice. We then returned to Lenes to unpack the hot kiln and finally home. Tanya prepared some pizzas, lovely, the potters also enjoyed them. For the full on weekend of the SLF the weather was forecasted to be hot and it was. Nilima discovered us early and proved to be invaluable as a supportive and caring translator. ML demonstrated outside and GRP inside, great interest and sold lots of pots. Saturday evening was an invitation social event for those connected in some way to the project. It was timed around the beginning of the firing of the drum kiln. The kiln had been packed with the children’s pots from the first weeks workshops. Food and drinks were being passed around, the potters refusing all. It was disclosed, and Nilima later explained at the lighting of the kiln that this is their practice as an acknowledgment of the gods and not wanting to offend, as, as soon as the kiln was lit the pots would be in the hands of these gods. GRP and ML completed a simple observance before lighting the diya that was the beginning of the firing. The firing stated a little after 6 and finished at 9. While the kiln was firing the wheels were ‘wound’ up and lots of people had a go with the assistance of the potters, it was a ‘good’ crowd. We were all exhausted but energized by the end of the evening. The Sunday was the family workshop day. Two families that had been in on the Saturday and had been so absorbed were back to do the workshop. It was a slow start as some families were late and it took time for the clay to be prepared, it wasn’t concerning me as it seemed we had plenty of time and it seemed a luxury not to have to rush but others were anxious about the slow pace apparently, (a comment from Simon indicated that to be the case). All had been very focused until the waterpots and materials were allocated and suddenly it was chaotic, everyone making sure they had what was required, but the atmosphere calmed when the participants became absorbed in painting their waterpots. In the afternoon more inside and outside sessions and, more talking. I was looking forward to our day off the next day. Monday the 18th of February, our first workshop free day, it had been a misnomer to call it a day off. First up was a visit to my nephews school to meet his class, he introduced the potters and I realized it was my turn to turn on the ‘introduction’, I was not in the zone. Tanya and Scott had organized a tour of the MCG for midday, before that though all the family workshop waterpots needed to be ‘fixed’ with hairspray and packed into the back of the ute, miraculously that was completed to be able then to drive to the MCG to meet Tanya and Scott. I enjoyed watching ML enjoy the MCG,. I don’t think it was of the same interest for GRP. Drove to Northcote Pottery with a back full of painted waterpots, it was a hot day… Angst when it was revealed that the kiln was half the size quoted. It had been the intention to return to Artplay to collect the other half of the kiln load, so, that was one less trip to do that day. We then did a trip to Easy Street with waterpots for another firing there. Then to Nadia and David’s for dinner. 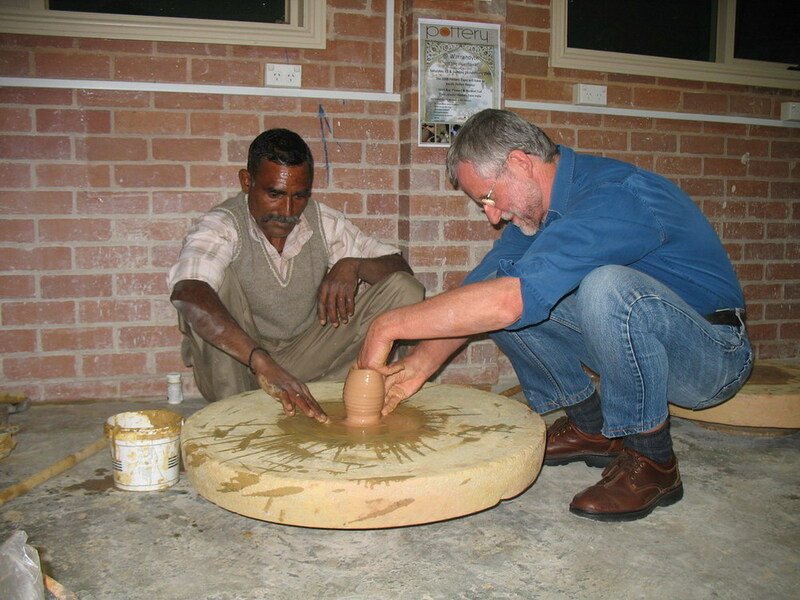 The potters were to make the roti, firstly the right equipment had to be sourced, a large Chris Pittard mixing bowl was deemed the right size and finally deciding on the gas B-B-que for cooking as the best option. There were many contributions to the beautiful meal and Abhijit interpreted many lengthy statements and stories from GRP. GRP deemed it the best meal he had had in Australia. Towards the end of the meal a friend of David’s Arvinder arrived with a friend of his. Chandrabhanu, a name from my past. A good friend of mine Angela and I, used to go to his performances in the late 70’s. I was awestruck to be sitting next to him. 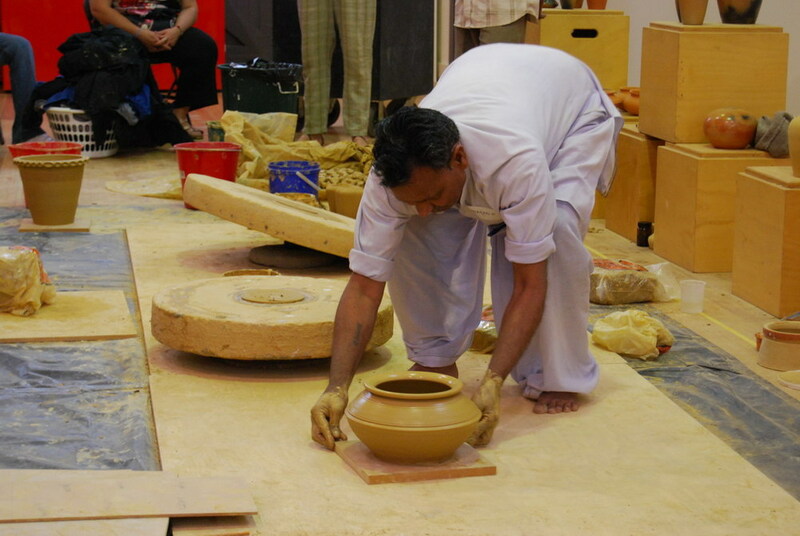 He was interested in the Rajasthaniness of the potters and stated he would be interested to visit the next day at the workshops. Tuesday the 19th began the week of Steiner school workshops, a much more relaxed approach. First was Collingwood College, the Steiner stream and then 3 groups in ascending ages from Gilghai, the more flexible timing promoted by the teachers bought about a more relaxed but meaningful workshop. 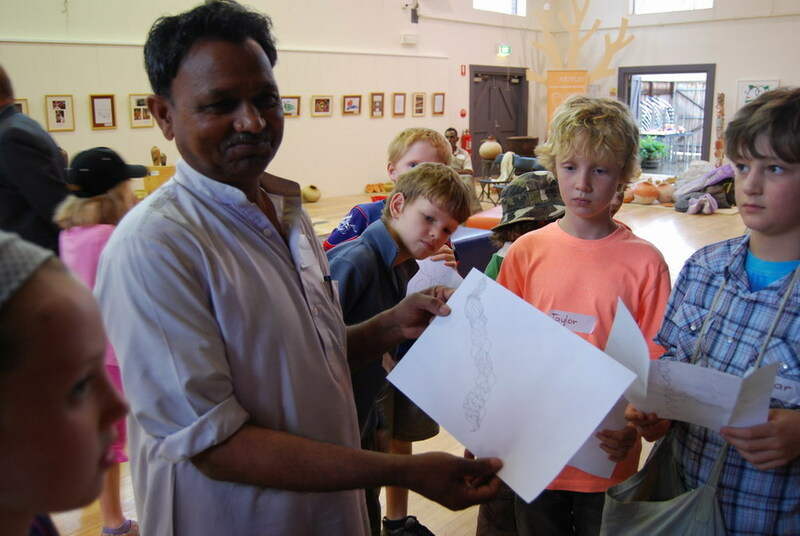 I think the Gilghai workshops were the most successful, the teaches related to the children in a very comfortable way. 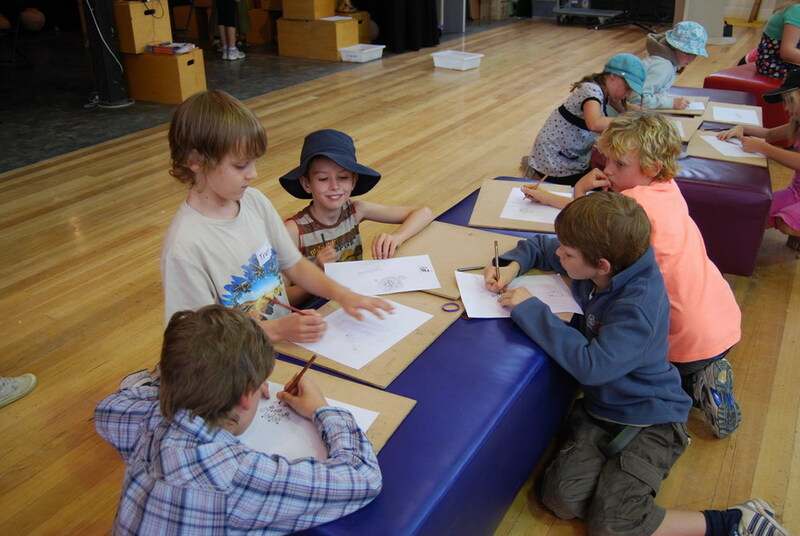 The groups responded to the drawing activity enthusiastically and created some enchanting drawings. The teachers in the first Gilghai group organized a most efficient and no fuss way for those who wanted to buy a pot to do so, along with the adults they bought over $400, they took their purchased pots home in the egg baskets they had bought for their own pots thinking hey would be taking their’ just made’ delicate pots home, the baskets did not go home without precious cargo. Although we were staying near Port Phillip Bay we had not made it to the water to breathe the air until the Wednesday evening. We did drive into a private car park near the St Kilda marina but it looked harmless enough. Two men from an adjacent café bought out some rubbish for the big dump bins. On exiting they must have reinstated a chain as when we went to leave…. “What to do?” Drive over it. Fortunately it wasn’t too high for the Hilux and we had no problem and by the look of the restraining poles we were not the first to do it. Thursday was another hot day, where were the hots days when we needed them for waterpot drying. After doing a trip to Easy Street we headed towards Manningham. On reflection this was the closest we came to discord. (At times I had become frustrated with the amount of discussion that sometimes seemed to be needed when to me it was action that was needed) but this was different. I was tired and just wanted a grassy patch on which to lie before the workshop and I did have to consult the Melways once, but I sensed impatience from GRP especially when we stopped at a bottle shop for a ‘fizzy’ sweet drink, it was outrageous to spent $3.50 on a soft drink, and yes it is. I did find my grassy patch and cooled down before the Manningham Art Centre Workshop. We did not have much to complete as some pieces had not dried properly/were too dry, so we were able to thoroughly discuss areas of interest. We also had time to look at the Indian studio images; the interested informed questions were welcome. The interpreters that had only known the potters for 4 hours presented then with gift, a reflection on our relationship to gift giving. Another late night. Friday the 2nd of February was our last day at Artplay it was our “bump out day’ I was not looking forward to it, we had already packed our Elwood gear. We had pots to pack up, pots to get to Easy Street for storage, cleaning up after two weeks of workshops and goodbyes to say before driving back to Tallarook, and, repacking for the early Saturday drive to the Pottery Expo at Warrandyte. I went into pushy frantic mode. Vicky was the cool head and managed to restrain her frustrations with Abhi, I didn’t. It happened to be this day that he decided to take GRP and ML to McDonalds for lunch ( he worked there) he was not able to read the situation. Vicky and I started to get on with the job. I was ‘fixing’ ML’s Chandrabhanu waterpots when they returned. I expressed by frustration at the bad timing of his gesture. I then took the pots to Easy Street and returned with Ann to Artplay for a farewell cup of tea. Simon and Eelin had prepared wonderful gifts and cards for us all and ‘thanks’ were spoken. Amazingly, we managed to get all that was left into the ute and the pottery circus ,(without wood on top this time as we had taken what remained from the firing to Elwood) left about 6p.m. It was a positive drive home. I was still in pack and unpack mode, so when we got home I had everyone on board and under ‘orders’ to repack the ute in daylight/dusk hours, before the much appreciated cooked meal was had. Going to bed unenthusiastic about the following two days is not a good way of being. 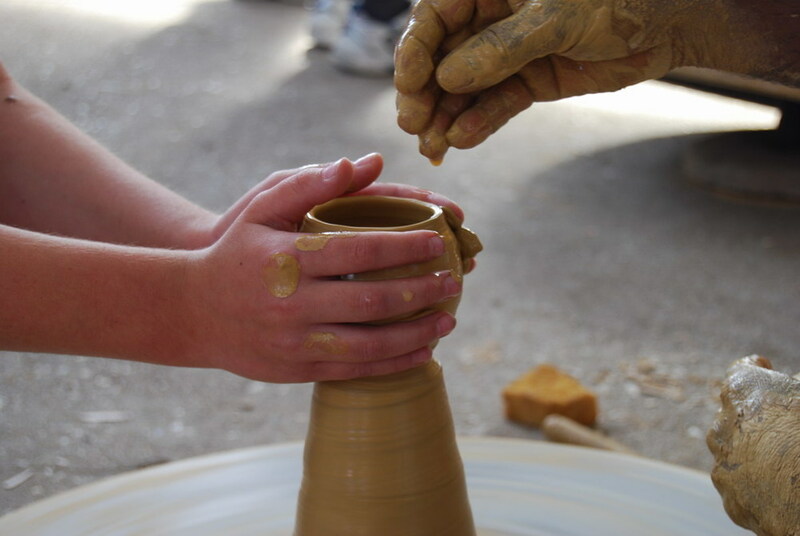 23rd and 24th of February Pottery Expo Warrandyte. When we left Tallarook, about 6.30.am there was drizzly rain and at that time of morning I find it hard to be optimistic. Jenny had packed my work into her car; I had packed my work up two weeks before. The potters work, the wheels and swags where in our car. ML came with me and GRP went with Jenny. It was a quiet trip. For the potters they would have had no idea what was in front of them other than they would be demonstrating and hopefully we would sell pots, the latter my major concern, and the outcome very much dependant on agreeable weather. Vicky was there when we arrived, without her and Jenny we would not have managed. Setting up my own work (this was my 8th Expo) is exhausting and demanding, to coordinate two setups… but we all worked well together to have the displays complete before the public arrived. I had discovered by this stage that my brooches had been left ‘somewhere’, they were usually the items of which I sold the most, this was a big disappointment. As it was possible it would rain at anytime both displays were under the one small shelter. Their work looked fine on the packing crates that had originally come from India. I will use them for my own displays in future. So, it ended up being a fantastic weekend. I was proud to be connected with these two men. When they demonstrated a crowded ring formed and it was a wonderful thing to experience such an appreciative response. For me there was lot of talking but the relaxed atmosphere made it easy. The waterpots began to sell well so I drove into Easy Street to collect the rest. It was respite but I was so conscious that I was in the stage of easily having an accident, beware. 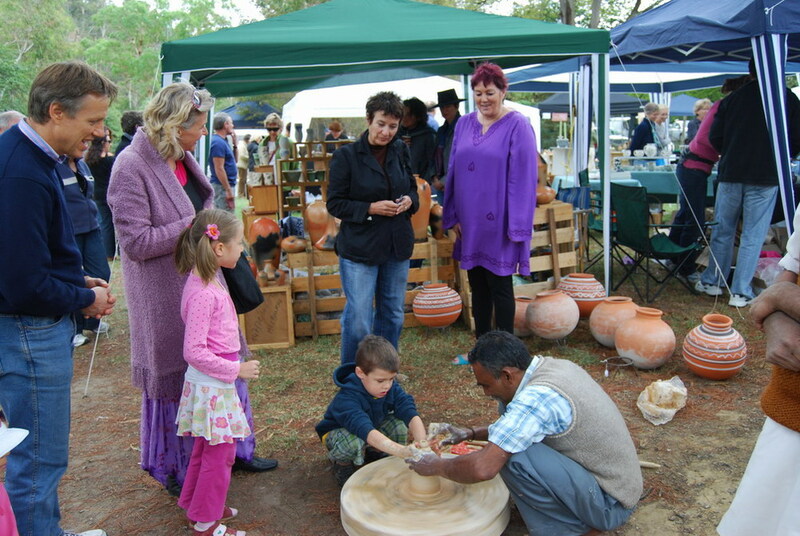 Over the weekend we sold all but one waterpot. We also sold lots of GRP pots, but still had some in reserve. I sold very little but that was to be expected and fine by me. There were many Indian/Hindi speakers so that made it easier, Nilima arrived with some amazing food, we were all happy to see her. As she was leaving she asked if there was anything I wanted to say to the potters. The end of their stay was looming and I could feel the emotion building and would have been in tears if I had spoken of anything that was in the front of my mind. Over the weekend we meet lots of wonderful people and once again the positive response was overwhelming. The weather stayed fine the whole weekend. Vicky returned Sunday afternoon, with chai and to help pack up. Another quiet drive home. Will had made the subji and Peter the roti. I was looking forward to a real day off the next day!! ( SEPS) to set up for the next days workshop and meet Jarnki who was to be our interpreter for the week. Also had time to ‘do‘ the Seymour ‘op’ shops. That evening began the Tallarook routine. The potters making the roti on the outside fire and me the subji and enjoying early nights. SEPS was a hectic day. After the first group we got the timing better for subsequent groups. The potters worked patiently with all the students, about 80 children made pots as well as the demonstrations for the five groups. At lunch time GRP and ML were swamped with adoring girls as they tried to have a quiet bidi under a tree. Wednesday was the first of the two days at Seymour Technical High School ( STHS). Those who participated were great, asked appropriate questions and in my memory were more receptive than 2003. Liz once again provided a beautiful lunch. Will was to have an x-ray at 3.30 so had to do a quick pack up. Back to the doctors as he has a suspected fractured thumb, she then organized an appointment at The Northern Hospital. Thursday was a special day at Tallarook Primary School (TPS), the small children were delightful and our only experience with the very young grades. ML was touched by their responses to the clay. Recently a mother of one of these children stopped me in the supermarket, firstly to thank me for organizing the ‘tour’ and then to relate how the workshop impacted on her son “he now goes around the house saying, that’s made of clay and did you see the way those potters sat. The pot he made has now pride of place in the crystal cabinet”. These comments cemented my view of the value of these workshops, for a first ceramic experience the magic those two spin will make it a memorable introduction to clay. So then to the last day at STHS. Once again the students were receptive, even the coolest participating and once again Liz provided a tasty generous lunch. At the end of the workshop was the final packup. (It later was disclosed while the potters where having a bidi break at lunch time they must have stumbles on the smokers corner as they gave out heaps of bidis) I had a few things to do and Will went to the $2 shop with the potters for some last minute shopping. They came back empty handed, why spend big money on crappy stuff you can but cheaper in New Delhi. So home to do the final unpack of the wheels. We begin to be in sombre moods knowing goodbye is looming. I rang Nilima to organize a 3 way conversation so we could all say what was needed with her translating. Meanwhile while they packed I went over all the money matters and then gave them the loot, we were all pleased with the outcomes. The telephone conversation was emotional basically from both sides, appreciation is there and more. A final dinner and then the one hour drive to the airport, all in plenty of time for the 12.45 a.m flight. Had never seen such a long a queue. We were on the look out for likely Hindi speakers to help out at Bangkok airport. Finally got to the check in and also receive their hotel vouchers. To find the hotel was a day stay in the airport was a great relief for all as they were most anxious about leaving the airport and would have been happier to spend their six hours hanging at the airport than risk leaving and not being able to get back in time for their home flight. They did have to repack their hand luggage but no drama as previous departures. By the time we had filled out departure forms it was time for them to go through the ‘closing’ doors. It is the hard moments when sometimes I think it is good to have limited common language. “Thank you” is enough and they disappeared.